Proper advertising is the only thing which will get you across to the consumer and land you into the success-land. We have covered a number of unique marketing strategies but well, Canadian Tire decided to come up with a unique ad of their own to start the New Year with style. Although Eastern Canada had to go through worse ice storms ever recorded in history, yet this idea is not ironic at all. The key component of this ad is the ice truck that was actually planned, manufactured and was ready to go before the storms took over. 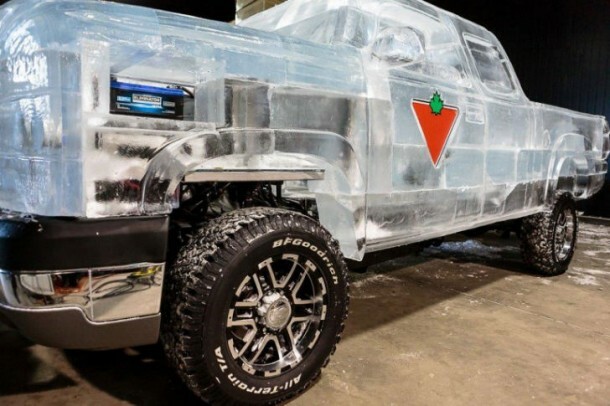 The manufacturers of this ice truck are the ice sculpturing house of “Iceculture” and “Canadian Tire”. The construction of this ice truck started off by taking a 2005 Chevy Silverado 2500 HD frame and then underwent a number of modifications to reach its final form. These modifications were a collaborative effort by Bronson Line Automotive Ltd, Pick Me Productions and ice sculpturists from Iceculture. The end result of these modifications weighed in at 15,000 pounds out of which 11,000 pounds are ice. 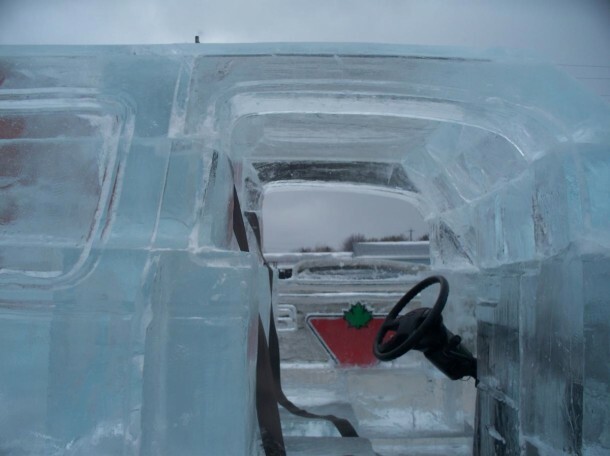 The end product was no easy task to achieve since the ice truck had to be capable of driving on road and had to look similar to the original version of the truck. 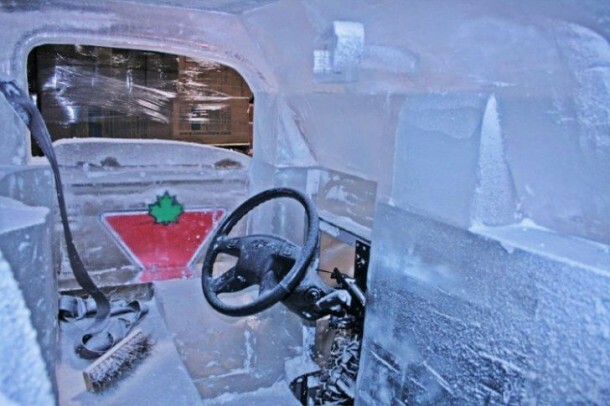 Now lets see how this ice truck was completed. First stop; Texas, Bronson Automotive took care of removing the cabin body and made alterations to the height followed by altering the width of engine bay. Next stop; Ontario, Pick Me Productions assigned a team to come up with a design, followed by fitting it in order to entertain an ice chassis. The final effort was done by Iceculture ; building three full scale trucks of ice for a commercial and promotional ad campaign. Simulations were carried out to ensure that no melting of ice took place and to design the exhaust for engine in the most efficient way possible. Special fans were employed to take out as much hot air as possible from the engine compartment in the least time possible. This was done to increase the time till which the ice could be preserved. CNC machine was used to cut out custom ice pieces and water was employed to hold the slabs together (talk about binding materials). As mentioned earlier, this whole endeavor was carried out to perform a promotional stunt, for a Canadian Tire ad. 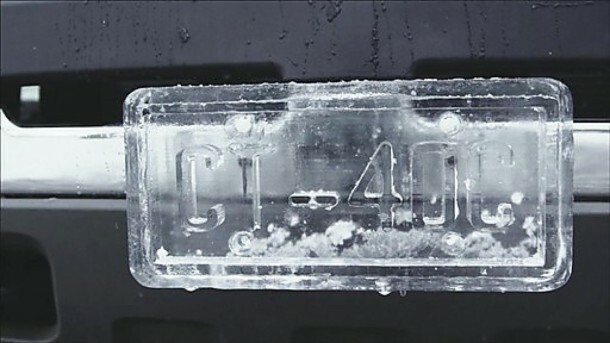 The three ice trucks that were built had their own purpose; one was a prototype, the other was a show vehicle while the third was the star of the commercials. 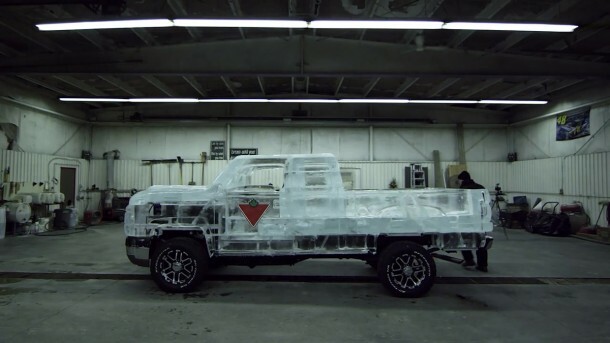 Once the commercial’s shooting was completed, the truck was sent to the Iceculture’s studio in Hensall, Ontario where it was reassembled in about 24 hours for a one mile drive to attempt a unique Guinness world record. Afterwards, it was taken back to studio where its melting, 40 hours, were filmed – part of the ad campaign.